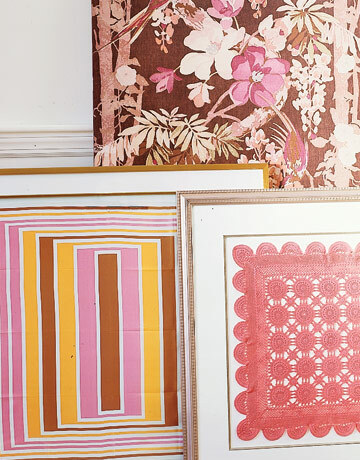 So you’re bored with your old white painted walls, or perhaps they’re not so fresh-looking anymore, but you don’t want to bother with wallpaper or prefer not to put nails in them to hang art. Or maybe you’re renting, or living in a dorm room, where you’re not allowed to make any permanent changes. Using fabric instead is a super easy way to add color and change the look of a room, and when you’re ready for a new look (or move out), all you need to do is take it down. Fabric on the walls is certainly not a new idea. Tapestries have been around for since ancient times and were hugely popular during the Renaissance. These days, however, you don’t have to settle for battle scenes on fabric so heavy you need hoards of people to move it. The options today are endless. Upholstery fabrics are nice and sturdy, and come in a myriad of materials and designs. You can create a huge variety of looks using lots of it, or just a few pieces. Cover an entire wall with fabric (using it like wallpaper), hang panels in select places, stretch it over a frame, put it inside a frame, cut out shapes and put those up, drape it over a bed, anything you can think of works. And it not only looks good, it helps soften the sounds in the room, and even provides a bit of insulation from outdoor/neighbor noises. 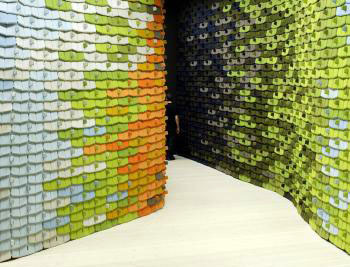 If you have tons of time on your hands and don’t mind a huge project, you can do what French designers Ronan and Erwan Bouroullec did in the Kvadrat showroom in Stockholm, Sweden: build entire textile walls using fabric “tiles” and foam core. I can only imagine how many hours went in to this, but I have to say I really like the result. I’ve always loved sleeping under a bed canopy (in Swedish, they’re called Bed Heavens), there is something so cozy and comforting about having that fabric over your head (without the claustrophobia that comes with sleeping in a small tent!). And it’s so easy to put up! 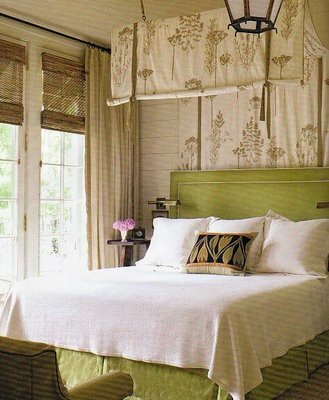 You can either put a rod on the wall above your bed, or just nail the fabric to the wall, and then suspend another rod as far out above the bed as you want the canopy to go. Just drape your fabric, and voila! 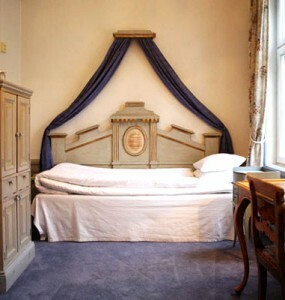 You don’t even have to put up a holder (like in the photo), you can just put a hook on the wall and then tie the fabric around that and drape over the bed like this. I would use a nice silk, or perhaps linen, designer upholstery fabric for this project, since it will be a huge focal point in the room. It honestly could not be any easier than this to add fabric to a wall. Just measure and cut out panels from you fabric (or ask the seller to cut them for you), finish the edges and hang them either from curtain rods mounted on the wall or nail them the wall, although I would not recommend the last option since you most likely will want to change the fabric every now and then (and take it outside to shake the dust off occasionally). I especially like to put wall panels up when the weather starts getting cooler, and using a rich, heavy material, like wool or chenille upholstery fabric, really warms the room up, both visually and literally. I live in an old house that didn’t have any insulation in the walls when we bought it (we had some blown in, but that only does so much), and in the middle of winter, those walls are quite icy to the touch. The fabric helps keep the room warm and cozy, and saves us a little on the heating bill at the same time. This is almost as easy. Just buy a simple plain wooden frame, or pieces you can assemble yourself, cut your fabric large enough so that it will wrap around the frame. Lay it upside down on a flat surface, position the frame on top where you want it to be, fold in the corners of the fabric and staple them to the back of the frame. 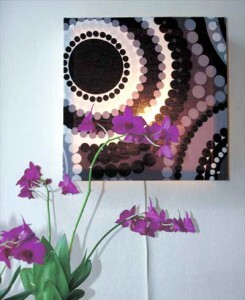 Make one large or several small ones and use as either pure wall decor, or as bulletin boards. If you want to take this project one step further, you can even turn them into diy wall sconces just by placing a lamp behind the frame (as in this picture). Any material works, and I like to use vintage upholstery fabric for these, (like the 70s-inspired kind used here). 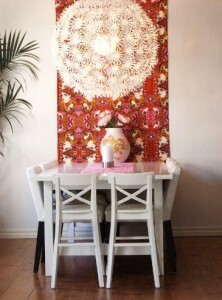 A great use of leftover scrap pieces, or swatches from a sample book. Use any type of frame you like, plain or ornate, and I always like to use a mat too, it adds such a nice finishing touch. Attach the fabric to the back of the mat, put the whole thing in the frame, close it up, and voila! 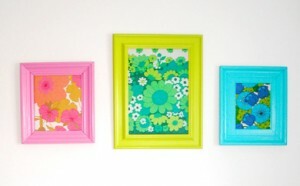 Framed fabric art! Almost any type of fabric and design, except for super thick or single color pieces, works for this. For more “fabric on the walls” ideas, check out my curtain fabric post. Also don’t miss my outdoor fabric post.